The dancer takes the stage. The performance has the rock-solid foundation of a guru's teachings, knowledge and many years of sadhana. 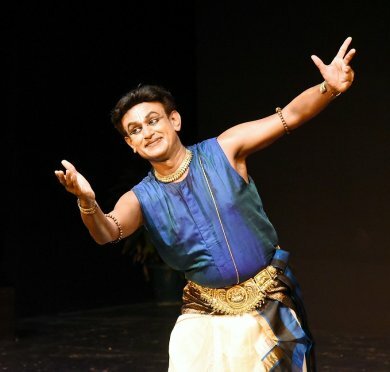 The musician, singer and dancer Dr. S. Vasudevan has been an integral part of many classical performances in Bharatanatyam and Kuchipudi as a composer and vocalist. He practices and teaches in Delhi, and has been a disciple of Dr. Vyjayanthimala Bali and Jayalakshmi Ishwar. It was after his very moving dance performance at the Sangeet Natak Akademi's event Sanskriti that I got to talk to him about his views on music in dance. 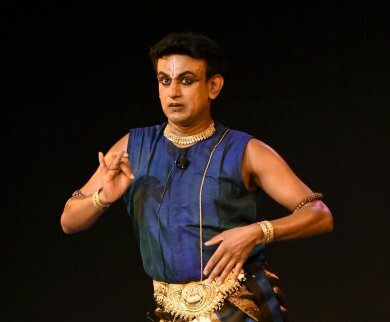 His latest works have been very impressive, for example, the music for Anekanta, dance and music for Dramatic Tales by Vanashree Rao, music for Pavitra Bhat's Shri Ranga Kshetra and Dakshina Vaidyanathan's Shri Venkata Kshetra, among the most recent ones. As a composer, could you describe the role the music has to play in the development of a classical performance? Our own shastras claim that sangeetam is an amalgamation of geetam, vadyam and nrityam - trayam sangeetam. The shastras are the science and our rishis or the shastravadas are the scientists, the architects, the practitioners, the 'ologists' of any art form. When we talk of dance, since I am also a dancer, I will be a little chauvinist. It begins with a sound within, which translates into a thought, which stretches into a theme, which becomes a melody, then a mime, which becomes a complete painting and a sculpture and a world with all of space as a canvas. I think dance is a huge process, and to me, it is different each time with different compositions and themes. For instance, I performed a piece called Amba Kamakshi. 'Amba', 'kama', 'akshi' - the one who is completely compassionate through her eyes; it floods, flows, reflects through her eyes. Her eyes are full of mercy, love, creativity and compassion. There is nothing negative in her eyes, there is nothing impossible. When we think of her eyes in such a huge canvas, she herself becomes the concept, and creates pockets and space for every part of our existence, before and after our life. We are only existing in this body - whatever we have gained in this life in this limited time. But the concept of Kamakshi is primordial, which we have personified into a feminine energy, a mother. She is the creator of nature, microcosm to macrocosm. She is the brahmand Janani, the source of everything, so we address her as the Janani. So when we deal with these kinds of themes, the sahitya plays a very important role - there is a lot of homework involved. Unless I know my mother, how can I elaborate upon her? Each composition a dancer deals with, Radha-Krishna or nature, any subject or concept we deal with - there has to be in-depth experiential understanding of that thing. All this collectively reflects and shines out through our dance. There is a big facility when you are a solo dancer and a big facility when you have live musicians, like I did for this performance. The most sought after singer is Shwetha Prasad. I heard that she started her career at the age of 10, and she is a self-made musician singing for dancers, observing dancers. Her music has improved purely because of dance, not by technical classroom learning. She is a better person to talk about the relationship between music, dance and sahitya. A dancer can always talk from the point of view of dance. A musician and singer talking about music for dance is a greater thing. Since I am also a musician, I have the facility of sharing both experiences. When I sing, the sahitya, the right raga, the right elongation, the squeezing or elongation of a tone, subtle and loud sounds, everything adds to the mood, the particular experience. The modal temperament is very important. It's a plus point if a dancer is also a singer, because there is a constant on-the-spot cooking up, all the spices added on the spot - it's so fresh. Whatever you've seen today, honestly, is not rehearsed, but for the calculation part, which ought to be rehearsed because it involves the musicians and the percussionists. But that's the biggest blessing of having a command over abhinaya, and it is achieved purely through your experience and total surrender to your guru's philosophies. It happens only once one totally surrenders to a guru in the real sense. Not just gurus by name, but the real gurus, elevated, epitome of experience and art. When they talk or stand or anything, the art flows out of them. I'm really blessed to have wonderful gurus attend today. It adds to your energy. Dance is energy. It's not exercise. It starts with energy, it ends with energy, it extends with, echoes with energy. Art is a spiritual process. When you compose music based on a dancer's original concept, how does that process work? How do rehearsals go? It works differently with different dancers, because each dancer comes with different kinds of content and levels of preparation. There are dancers who are experienced and very clear with their vision of concept and choreography. For them, if they have the material - any script etc. - and they are very clear in their flow of ideas, which is very important. When that vision is clear, it becomes very easy. When I see a dancer explaining something, it looks like a movie to me and immediately some sound comes from somewhere, some rhythm happens and it's like okay, this should be like this. If someone is sleeping or in a resting pose, and trying to wake up or struggling to wake up, it starts with a low tone, with a slow pace, and gradually, musical embellishments are introduced, rhythm is very carefully treated. It's different with different dancers. It's the vision first, then the script, then the music comes, and then the choreography grows. It comes to a form, a shape, it gains a complete body. The thought is the seed. It has to grow and expand into a canvas of possible elements that should be in the choreography. Then we can edit - how much we want, what we don't want. But initially, we gather everything on the table, we have all the colours, then we mix the colours, mix ideas, we sequence them, chapterize the flow of ideas. Then the music is organized. The music also goes with the idea, but finally, they are at different stages. It's a very interesting process. Does the choreography follow the music, or does the music follow the choreography? Both ways. Sometimes, the vision is so strong the music is just a vehicle for the choreography. But sometimes the music becomes so powerful that the choreography naturally falls into place accordingly. The choreography is effortlessly laid over the rhythm and music; they are so strong, so dominant. But there are situations in which the choreography is strong and the music is just carrying the choreography, supporting it. That happens many times. The dancer has to have a strong musical understanding. I'm not speaking politically - it's a very natural thing. The more the dancer understands music and rhythm, the deeper the choreography. It's more communicative, more comprehensive. Till then, it's only a body movement or exercise. It makes a big difference. Exactly. We don't believe in body language. We call it angashuddhi, a cleansed body. When a body is cleansed in various perspectives, the stance itself is cleansed. The thought itself is cleansed. The glance is cleansed. The anga, pratyanga, upanga - the entire body, which is a combination of major and minor limbs - everything is initially trained, cleansed, then the choreography or composition is introduced to the body. Unless the body is prepared, nothing will work. Unless the body is fully equipped with the software or the operating system is fully, comfortably installed, your features are not friendly with you. So if your computer system or mobile has to be friendly with you, all your features have to be activated. The body has to be activated with all the required subtle things. Without an understanding of music and rhythm, dance is impossible - a dancer is not a dancer. They don't have to be perfect at it, but they should have a workable understanding of music and rhythm. In today's performance, the raga that was chosen reflects the karuna in its own way. How do you achieve that? That is the genius of the composer when the dancer can relax. I would not say that I have exerted myself because the composition makes you... anyone who knows the language and is a musician, we are already entranced. The moment it starts (sings opening words of Amba Kamakshi) with Amba, mother, compassion is by default there, in the first letter, the first word. Syama Sastri is the personified devi. He's devi himself. The beautiful way he has composed and initiated this composition is - the first letter is 'a', and the first source is 'Amba'. He's a very tricky thinker, a natural thinker. He doesn't have to exert himself because he's already swimming in that ecstasy. Such people, they don't have to refer to a dictionary or check with scholars - everything naturally falls into place, beyond right and wrong. The tone starts with a mandra sthayi, that's humility, approach, tenderness, request, seeking, yearning, also the child who is totally innocent - I can't understand you. He calls her Mayamma - you are the mystic mother, beyond my understanding, but one thing is for sure, I am your child and you are my mother, and so you ought to obey me. Brahma, Vishnu etc. can offer you their services, whatever - they are Brahma and Vishnu, they can do many things. I am only a child, what do you expect from me? I can only play my tanpura and sing the melody for you because that is what you have given me. Everybody is offering services to you because you have made them capable of offering them. Without your intention, what are they? That is the composition's claim. They might be the trinity and all, but can even they completely know you? No, and that is my situation too, so we are no different. So you better come to me also. There is a humility, but there is also a comparison - when you are mother, you cannot be biased. That is the confidence of the bhakta, the child - you throw me anywhere, I am going to fall on your lap. That's how intense a composer and poet he was. So if we have this kind of understanding of the subject and composition... being with your guru teaches you that. Guru seva is very important. I am just obeying my guru. Even today, my guru Vyjayanthi amma dances here (points to his head) and I dance at her instructions. You both danced and sang during this performance. For me, it was not two different jobs. It was a collective job. It's just that I am a limited human body - I can't sing the whole composition and also dance, but Shwetha is the best singer, she has understood me and was totally in sync with my mood. When I sang, I just danced. The music was not happening separately. It was a manifested sound - the dance in the form of the sound also. You said a dancer is only complete once they understand music and rhythm. Is the opposite also true - that to compose for dancers, you have to understand dance first? It's not necessary but it becomes necessary because if you want to professionally be a complete artist, all these five fine arts, the panchalalitkala - are very important. You cannot deny colours, you cannot deny any genre of music, you cannot deny the architecture, and you can't deny any kind of craft, sculpture, design or carvings. Everything adds to your mental aesthetics. How does the vision come? A visualisation is not one person or one landscape or a garment or plant or tree - it's a totality. I can think according to my personality, my level. I can comprehend according to my personal psyche. Different people think differently, we have different levels - some are comprehensible, some are beyond our understanding, but they are also dance, also music. Thus, to come into a proper consolidation, a consolidated way of understanding our classical dance and music, these things should be there, some things should not be there. These dos and don'ts one has to know. Till you have followed this manual, you cannot call yourself a classical artist. You have to fit into that box. Even art music has a system; it has a flow, a vision. System is must - one has to conform to one particular system. I, at least, feel I am free from confusions, I know what I should not do, and I know what I should do.